My client has had ongoing tension in relation to her Mother. The most common frustration being that when they speak on the phone that her Mother dismisses her sadness or current problems and highlights her OWN frustrations and difficulties in life. There is always someone else that has it worse, and her problems are therefore dismissed. My client is also my friend and it has been hard to watch her go through this and be the better person and just listen to her Mum, but simultaneously feel as though she is unsupported and unheard and unvalued. I explained how all relationships are a reflection of the energy between us and something else, and that tools such as EFT are highly effective to evolve them beyond their current state. We tapped for “Calm” to de-stress her energy system first before considering the issue with her Mum and talking about that. She considered her strength of feeling to be -6 on the SUE scale to begin with, from -10 to +10. The most noticeable emotion that she was feeling was “Frustrated” and this is what she tapped for. The feeling of frustration was reduced and the strength of feeling now was at -3. She was reminded of situations, aside from the phone calls, where her Mother had put her feelings aside for favour of her own. She had felt that from quite a young age. So she tapped for “Selfish”, which brought her to -1, and then “Not listening”. At this point my client started thinking about an issue with her son instead! She said that she wasn’t worried about this anymore. Which is a great indication that we are at a neutral state and can begin energising with positive statements. I asked her how she wanted to feel in the relationship with her Mum. She said she wanted to feel “Comforted”. She tapped for this and was then at +2. Then “Supported” which brought her to +4. She was reminded of a situation years before where someone had been demanding of her time and had pushed her to hurry up when she knew it wasn’t possible or practical. Her Mum was a witness to this and had taken her aside and told her not to worry, that “I will stand up for you, it’s okay”. Which was a significant moment in demonstrating just how supportive and comforting that her Mum could be. Finally she tapped for “Loved”. She then felt that the strength of feeling about her relationship with her Mum was +9! As her friend and half of her ‘EFTeam’, I am delighted to have been part of this transformation and cannot wait to see how things progress and improve between her and her Mum. The main source of frustration in my life is my children. My children are constantly fighting and playing up and acting bored really, I am permanently at the point of “Over it” lately, even if I start the day with great intentions and a positive spring in my step. I had had physical steps in place to handle things and felt like things were okay. Until… I saw this on Facebook. I had a really strong reaction to it. I saw the very sad mother duck, crying herself to sleep while she is cold, her ducklings warm under her feathers, ripped from her body. I was wondering if mother duck would get to sleep, would get to feel comfortable. And she would then need to wake and be on mother duck duty the following day, exhausted and featherless. 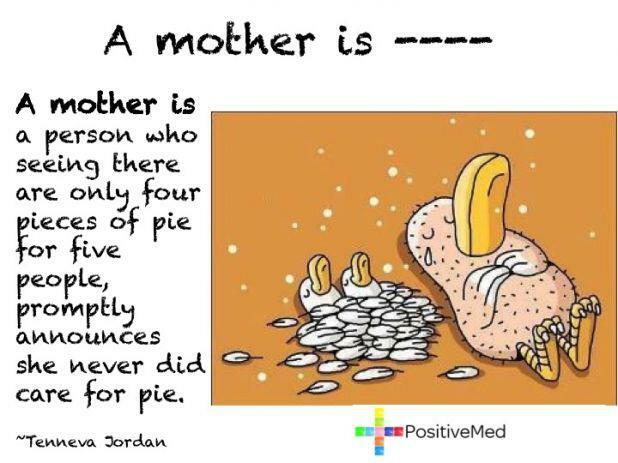 And the quote about pie – has this family never heard of sharing?! Why should a mother be someone who denies their own needs and puts themselves last? Both the words and image together made me quite annoyed. I’m a mother but I never signed up to put my needs last. I never signed up to suffer in silence or go hungry or cold. And many other mums I asked about this agreed with me, but still I wondered why this had ticked me off so much. Things that tick me off (and probably you too! ), getting a strong reaction, are reversals. Energy zzts that have got hit in the process of seeing, thinking or feeling something. Nerves that have been touched. So there was something there, but I didn’t know what. I also felt very strongly I did not want to put the kids first. But that maybe I should want to, (“if I was a good mother”) and I didn’t. Why didn’t I want to? I had taught my husband Project Sanctuary and how to create energy habitats for specific issues, so ‘for fun’ (my poor, suffering, husband) created me a habitat specific to this issue. Something that would help me understand what was going on in terms of the reversal. He ‘saw’ a pre-school or kinder type of environment and felt that I was one of the kids. That the issue relates to something that happened when I was a kid. I thought about that more, didn’t come up with anything immediately, so used good old energy to help me. I did forensic EFT to drill down on what might have happened. I was faced with a situation where a pre-school teacher had asked me to go away, to go and play something, when I had been trailing her and following her around. I recalled a guitar, and felt that it had been music time and then free play and I hadn’t gone off to free play. So I got told to go off. I felt hurt, rejected, abandoned. I tapped on those things for that pre-schooler me and wondered if that was it, but got busy and didn’t get to place attention on it. A few days later I was sitting in the bathroom while my kids were in the bath, my husband with me. He looked worn out and a bit stressed. I suggested EFT, even offered to tap him and he said no, he just didn’t feel like it. The kids were too loud, he couldn’t focus. After the bath I had dressed my daughter and we were talking about her skin that has a lot of marks and sores on it. We had applied the usual cream but the redness was persisting. It is a bad time of year for dry skin and irritation but this seemed worse than usual. She said all the sores and red marks were because she had scratched it with her long nails. I trimmed her nails and asked her what she felt when she was itchy, what it reminded her of. She said she felt sad and it reminded her of me going away, when she was asleep and when I was going out with friends without her. She also seems to itch a lot more when she is in her bed or when she is in trouble. (incidentally, base chakra = skin and base chakra also = mother relationship, and itchy = irritated..) So we tapped for her itchy skin after talking about it. Just one round. And then she sighed and said “I don’t want to do this anymore” and went off to play. It’s silly but it really hit me hard and I got upset. If I couldn’t get my husband or my daughter to tap with me, what hope did I have of getting anyone else to want to? How was I meant to help and be useful? And I tapped for that and recognised that my daughter was in a similar situation, with me not giving her interests a lot of attention either. Silvia Hartmann has written an entire program (for dog training nonetheless but the approach translates to parenting) whereby the most important element to having a positive relationship as well as reducing issues is ATTENTION ENERGY. Giving attention and giving love with that attention. I hadn’t been doing a lot of that. In fact the main time that I gave attention was when I was in the role of helper/healer. What if my kids were perfectly fine and didn’t need help? Could I still give them attention? I didn’t want to manifest them having problems by focusing on it, what was I doing here?! So more tapping. More rejection, abandonment, feeling like an annoyance just for being who I am, more sense of respect and love for the individual journeys we’re on, including our individual interests and passions, more love all round. Significant energy shifts here and feeling a zillion times better. As I put my daughter to bed that night, I said “If I ever made you feel rejected or unloved because I said no to playing with you or did my own thing, I’m really sorry about that. I love you very much.”. And she is so right. It really hit me to hear that from her, but she was right and I couldn’t deny it. They sleep 12 hours overnight, giving me approximately 3 hours of Me Time every night including whatever else I do through the day while they are awake. I thought about the things that I did on a daily basis and recognised that the majority of things I was doing WERE for me. I had really got away with being a pretty selfish Mrs Duck, and my ducklings were the ones who were being put last. So it comes as no surprise, in hindsight, that that image on Facebook created a reaction in me. Deep down I knew what was going on, but I didn’t make the appropriate connections, or just didn’t want to own up to them. This also is further unfolding of other challenges I have felt or experienced with my children. Will shifting that sense of abandonment and rejection make the difference? I know what I need to do in practical terms, it’s just flowing with that and softening any resistance as it presents. What kind of Mother Duck are you and how do you give attention energy to your ducklings?